A woman who sells cymbals, drums, and baking pans from a street stall arranges her merchandise in the Verng Nakorn Kasem neighborhood in Chinatown. You could build a career in Bangkok photographing the old neighborhoods and markets that are being torn down to make way for new condominium and shopping mall developments. 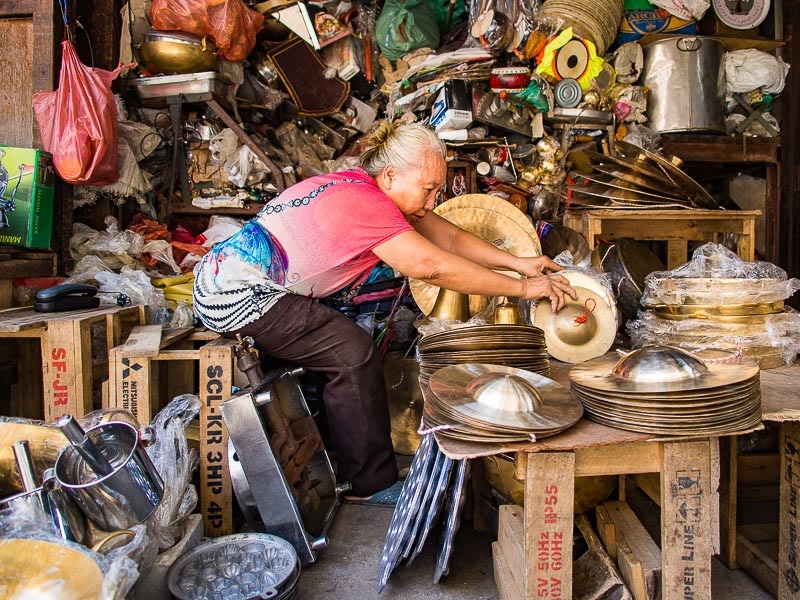 The latest market closing is the Verng Nakorn Kasem neighborhood in Chinatown, also known as the "Thieves' Market." The neighborhood is famous as the shopping district for music instruments in Bangkok. From traditional Thai instruments to electric guitars, keyboards and drums you could find it there. The neighborhood was also dotted with small mechanic shops and food stalls. Inside an abandoned shop in Verng Nakorn Kasem. Verng Nakorn Kasem was owned by one family and the shopowners rented from that family. The family decided to sell the land and the new owners, who own other large parcels in Bangkok, including the Asiatique development, want to redevelop the area into a mall. The current lessees are leaving as their leases expire. The neighborhood is following a familiar pattern. 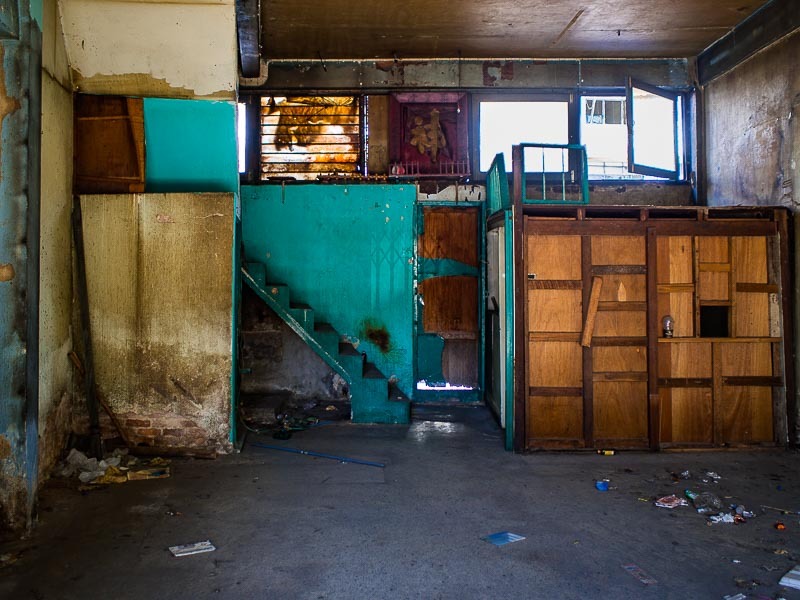 A woman walks by shuttered shops, their fronts blocked by construction fencing. 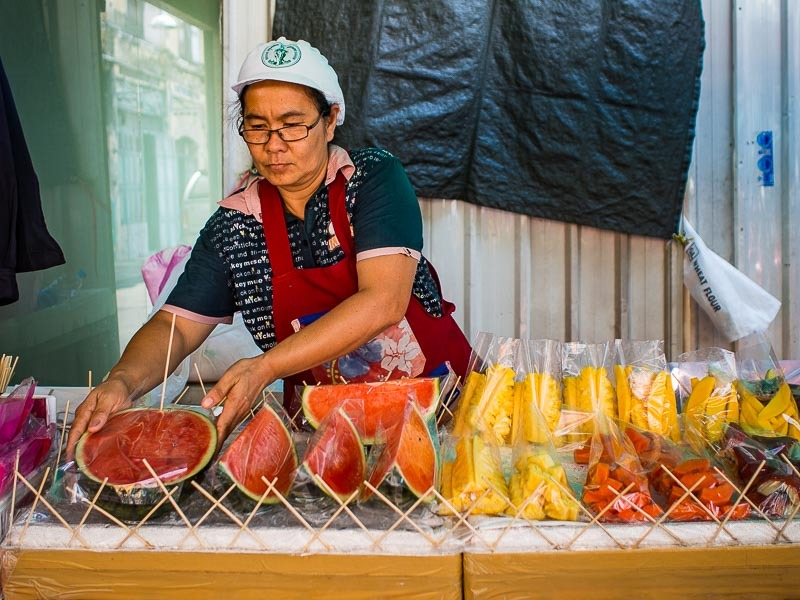 About a block away, a woman sells fresh fruit, using the fence to shade her from Bangkok's blistering sun. First one or two shops close and they're hardly missed but as more shops close, the neighborhood loses its vitality. And then it loses critical mass until the remaining shops struggle to stay afloat. 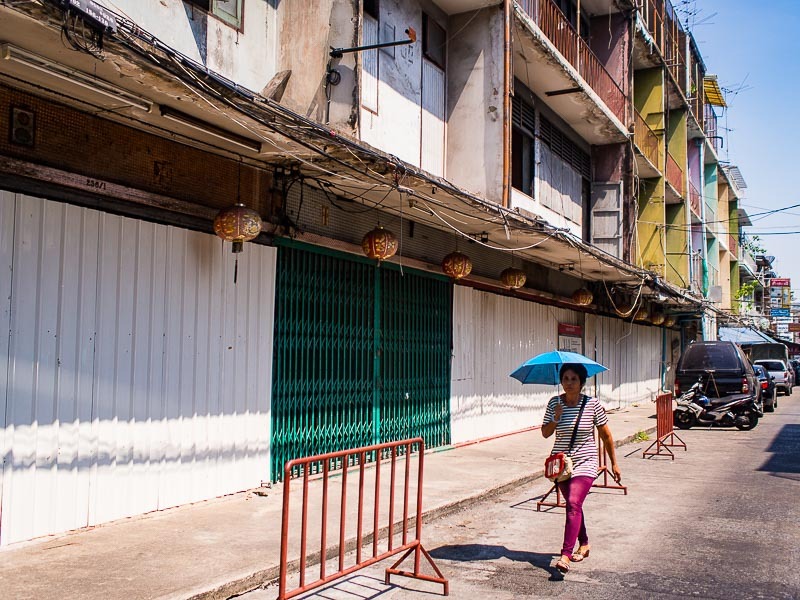 People have already moved out of many of the shophouses in Verng Nakorn Kasem. This is not a normal scene in Bangkok. 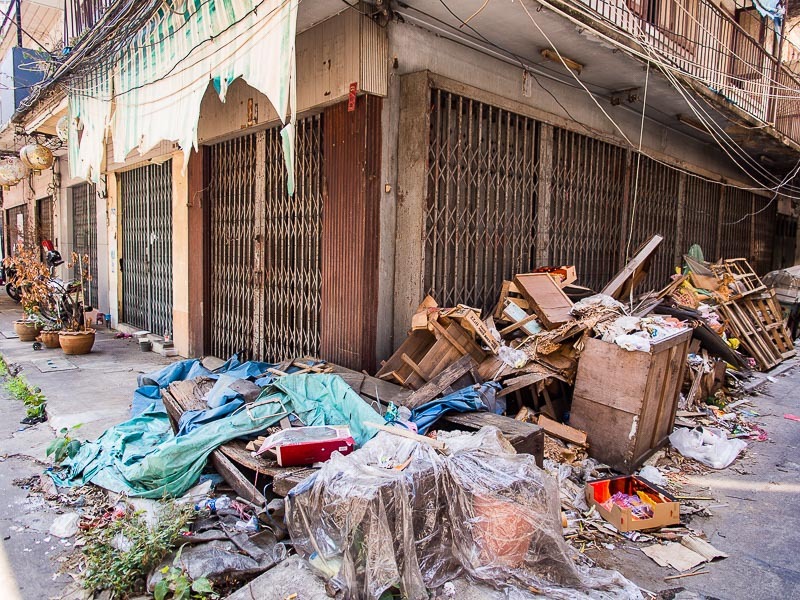 For a city of 12 million people, Bangkok is quite clean and surprisingly well ordered with regular trash pickup. You only see scenes like this in neighborhoods where evictions are taking place. I just found out about the evictions in Verng Nakorn Kasem and the neighborhood's transition is already well underway, so I don't know how often I'm going to go back there. 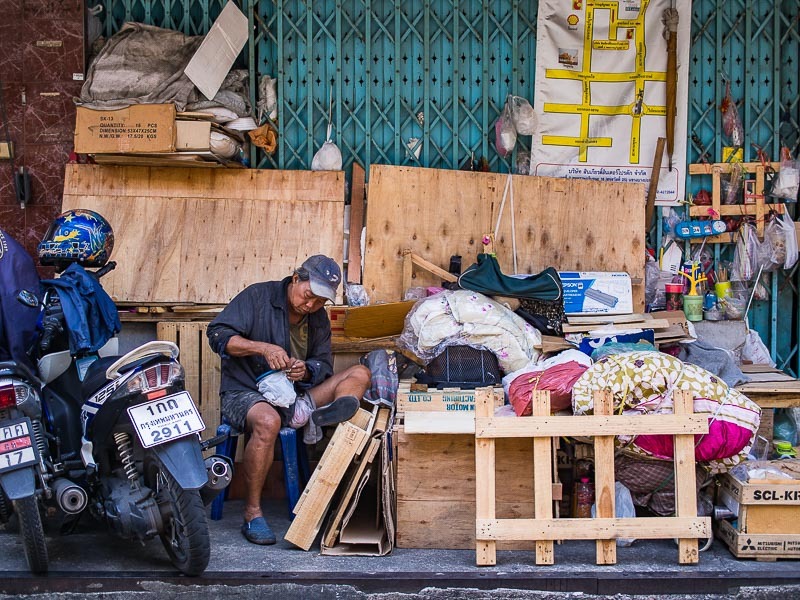 A man sorts recyclables he recovered from abandoned shophouses in Verng Nakorn Kasem. I am not a musician and I've never shopped for instruments in Bangkok. Nor have I ever really explored Verng Nakorn Kasem. Its passing doesn't impact me directly. It's more a symptom of how this remarkable city is changing. The things that make Bangkok unique are being torn down and replaced with condominium developments and malls, not that different from what you would find in New York, London, or Singapore.